EU equality law is multidimensional in being based on different rationales and concepts. Consequently, the concept of discrimination has become fragmented, with different instruments envisaging different scopes of protection. This raises questions as to the ability of EU law to address the situation of persons excluded on a number of grounds. This edited collection addresses the increasing complexity of European Equality Law from jurisprudential, sociological and political science perspectives. Internationally renowned researchers from Scandinavian, Continental and Central European countries and Britain analyse consequences of multiplying discrimination grounds within EU equality law, considering its multidimensionality and intersectionality. 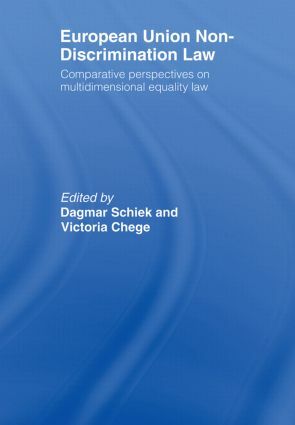 The contributors to the volume theorise the move from formal to substantive equality law and its interrelation to new forms of governance, demonstrating the specific combination of non-discrimination law with welfare state models which reveal the global implications of the European Union. The book will be of interest to academics and policy makers all over the world, in particular to those researching and studying law, political sciences and sociology with an interest in human rights, non discrimination law, contract and employment law or European studies. Intersectionality scope and multidimensional equality within the European Union: Traversing national boundaries of inequality? Stigma: A limiting principle allowing multiple-consciousness in anti-discrimination law?